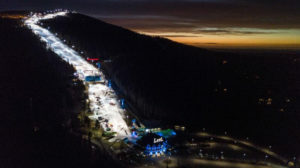 Levi, Finland – Overall World Cup champion Marcel Hirscher of Austria emerged victorious in Sunday night’s first slalom of the World Cup season in Levi, ahead of Henrik Kristoffersen of Norway, and Sweden’s André Myhrer. Hirscher’s win was his 59th on the World Cup circuit, and 28th in slalom. The Austrian superstar, who became a father for the first time this summer, also grew his reindeer herd with “Mr. Snow,” a new companion for his two other reindeer Ferdinand and Leo earned through victories in Levi. Hirscher was just returning from an ankle injury last season when he entered the starting gate and impressed the crowd with a 17th place. He continued to win his seventh consecutive overall World Cup title, and fifth World Cup slalom title in 2017-18. With his second place finish, Kristoffersen claimed his 10th slalom podium in a row. After finishing on the podium in each of last season’s slalom races, the Norwegian tech whiz pushed hard in both runs, to finish +0.07 seconds behind Hirscher in the first run, and +0.09 in the end. Myhrer the reigning Olympic slalom champion, was able to round out the podium in third. The Swede is looking towards the upcoming World Championships in Åre, but every slalom podium helps him to build momentum towards a World Championship medal in front of a home crowd. Myhrer will be 36 years old when the World Championships arrive in Åre this February, making him the oldest slalom medal contender. Levi was a difficult stop for the American men’s squad. Five Americans started, though none qualified for a second run. 2018 Junior World’s bronze medalist Luke Winters (Gresham, Ore.) was starting in his debut World Cup and was skiing solid and strong, on pace to qualify for the second run before getting low on a left-footer, sliding on his hip, and skiing out. Up next, the FIS Ski World Cup tour heads to Killington, Vt. Nov. 24-25 for women’s giant slalom and slalom events, while the men are off to Lake Louise, Alberta, for downhill and super G Nov. 24-25.